For the nearby Taoyuan Metro station, see Taipei main station (Taoyuan Metro). The old Taipei station in 1948. Taipei Main Station (Chinese: 台北車站; pinyin: Táiběi chēzhàn) is a railway and metro station in Taipei, Taiwan served by Taiwan High Speed Rail, the Taiwan Railways Administration, and the Taipei Metro. It is also connected to the terminal station of Taoyuan Airport MRT and the Taipei Bus Station. In 2017, it was the busiest station on all three rail systems, with a total of 190 million entries and exits. The four-level station is located in the Zhongzheng District in downtown Taipei. The underground station area south of the station is known as "station front" because the original railway station's main entrance faced south. Accordingly, the area just north of the station is known as "station rear." The station rear area is actually located in the Datong District. The commercial districts around the station are popular with students and commuters, and boast a large collection of bookstores, eclectic businesses targeting students, and cram schools. Because of its location at what is roughly considered the center of Taipei, the station is a popular meeting point for students and tourists. The station itself is a large building which houses multiple rail services as well as serving as the headquarters of the Taiwan Railways Administration. The railway platforms are located on the B2 level, while the B1 level serves as a waiting area. Ticketing services are on the first floor while the second floor contains a food court and several stores, including the shopping center (Breeze Taipei Station). The upper levels are occupied by TRA offices. Taiwan Railways Administration: Passengers can board a train to most cities in Taiwan without transferring. East-bound (clockwise) trains travel to Keelung, Yilan, Hualien, Taitung, etc. West-bound (counterclockwise) trains go to Hsinchu, Taichung, Tainan, Kaohsiung, etc. Taipei Metro: Taipei main station is served by both the Red line and Blue line directly and is a major transfer hub. Taiwan High Speed Rail: Scheduled HSR services began operating from Taipei on 2 March 2007. HSR train used to terminate at Banqiao station. Using platforms originally used by TRA, the station serves around 140 trains per day (departing and arriving). Taipei Bus Station This multi-use complex is located adjacent to Taipei station. City Buses: Bus routes to destinations within Taipei and New Taipei, both located in the Taipei Basin. Intercity Buses: Many bus companies provide service from Taipei to cities in the western half of Taiwan as well as Yilan. They also provide service to the Taiwan Taoyuan International Airport with traveling time around forty minutes. Taiwan Taoyuan International Airport Access MRT System: A new rail line to Taiwan Taoyuan International Airport which started operating on 2 February 2017. Taoyuan Metro A1 Taipei Main station in February 2017. The first rail station in Taipei was completed in Twatutia in 1891, during Qing rule, when the railway to Keelung was opened for service. Initially, a temporary station was built while a permanent station was constructed in 1897, during Japanese rule (1895-1945). In 1901, the station was located to the east of its current location. It was rebuilt in 1940 to accommodate growing passenger traffic. To alleviate traffic congestion caused by railroad crossings in downtown Taipei, an underground railway tunnel between Huashan and Wanhua was built along with the present station building as part of the Taipei Railway Underground Project. When the underground system was completed on 2 September 1989, railway service was moved to the newly completed building (completed on 5 September 1989) and the old building as well as a temporary station were demolished. The current station was further expanded with the opening of the Taipei Metro. The metro station is connected to the basement of the railway station and opened to passenger traffic in 1997 to the Tamsui–Xinyi line. Extensive underground malls now exist at the front and back of the station, which emulate those found in Tokyo and Osaka, Japan. The station also became a terminus for Taiwan High Speed Rail trains when the network began service in 2007. Taipei station and the area surrounding it have been undergoing renovation since 2005. Japanese architect Fumihiko Maki was chosen to design two skyscrapers that will surround the railroad station. Maki will also oversee the renovation of Taipei station. The height of the taller tower will be 76 stories, whereas the shorter tower will be 56 stories. The two skyscrapers will be constructed on empty parcels found adjacent to Taipei station, above the Taoyuan Airport MRT station. The station interior underwent renovation work from February to October 2011. Basement restrooms were renovated, the basement and first floor preparations for additional Breeze Plaza retail space began, the large ticket office in the first floor lobby was removed, and additional retail space was allocated. In addition, the flooring on the first floor was completely replaced, fire and evacuation regulations were improved, and solar panels will be installed on the station roof. Wikimedia Commons has media related to Taipei Station. ^ a b c d "車站基本資料集". Taiwan Railways Administration. Retrieved 3 November 2018. ^ "高鐵沿線里程座標相關資料". data.gov.tw (in Chinese). Retrieved 30 August 2018. ^ "各站營業里程-1.西部幹線". Taiwan Railways Administration (in Chinese). 11 December 2008. Retrieved 29 August 2018. ^ "車站數-按等級別分" (PDF). Taiwan Railways Administration (in Chinese). Retrieved 30 October 2018. ^ a b "臺鐵統計資訊". Taiwan Railways Administration (in Chinese). Retrieved 30 August 2018. ^ Lee, Yung-chang (April 2017). A Living Landmark (PDF). Taipei, Taiwan: Taiwan Railways Administration, MOTC. ISBN 978-986-05-1933-4. Retrieved 31 August 2018. ^ "臺北車站地下化". Railway Reconstruction Bureau, MOTC (in Chinese). Retrieved 30 August 2018. ^ "臺灣鐵路電訊". Taiwan Railways Administration (in Chinese). Retrieved 4 September 2018. ^ "計畫介紹- 高鐵建設- 台灣高鐵". Railway Bureau, MOTC (in Chinese). Retrieved 29 August 2018. ^ "交通部統計查詢網". stat.motc.gov.tw (in Chinese). Retrieved 30 October 2018. ^ "Chronicles". Taipei Metro. 5 December 2013. Retrieved 29 August 2018. ^ "More than just a station". Taiwan Review. 2010-02-01. Archived from the original on 2011-07-16. Retrieved 2010-02-18. ^ 旅運持續成長，台灣高鐵週五至週一增班 (in Chinese). THSRC. 31 December 2009. Retrieved 2010-01-03. ^ "「交九」開發案竣工　臺北轉運站啟用營運". Department of Rapid Transit Systems. 2009-09-01. Retrieved 2010-06-20. ^ "Work on airport MRT's Taipei section starts". Taipei Times. 2009-02-24. Retrieved 2010-06-17. ^ 專題報導 Special Report: 中正國際機場聯外捷運線A1車站之規劃設計. Department of Rapid Transit Systems. 2006-07-01. Retrieved 2010-06-19. ^ "Building History of Main Routes of Taiwan Railway". Taiwan Railways Administration. Retrieved 2010-06-16. ^ "Taiwan Railway History". Taiwan Railways Administration. Retrieved 2010-06-16. ^ MacDonald, Phil (2007). 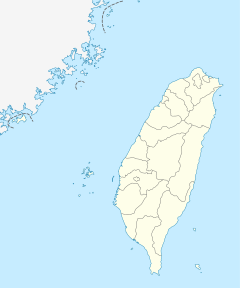 Taiwan. National Geographic Books. p. 59. ISBN 1426201451. ^ "Japanese architect wins design bid". Taipei Times. Deutsche Presse-Agentur. 2005-07-20. p. 11. Retrieved 2010-06-17. ^ "Diaphragm Wall and Foundation Piles Construction of Taipei Main Station JD Buildings". Department of Rapid Transit Systems. 2011-07-01. Retrieved 2011-07-22. ^ a b c 2-10月大翻修 台北車站黑暗期來了 (in Chinese). 中國時報. 2011-01-17. Archived from the original on 2011-01-20. Retrieved 2011-01-25.